He is the other Aaron, the loser of the Yankees’ right-field competition in spring training, the former first-round pick who for many years was considered a bust. Aaron Hicks is not Aaron Judge, but after Friday night’s game his former Twins teammate, Torii Hunter, called him, screaming and yelling like a little kid. The two had spoken before the game about hitting off-speed pitches. Hicks responded by hitting two home runs in an 8-2 victory over the Orioles — one on an 81.2-mph changeup by Dylan Bundy, the other on an 89.1 slider by Edwin Jackson. Hunter said he was “shocked” by Hicks’ performance — shocked and delighted. Hicks, meanwhile, relished Hunter’s approval, considering all the tough love that the veteran administered to him when they were together with the Twins in 2015. “It seemed like every day, I was never doing the right thing,” Hicks said. Hunter did not dispute that assessment. Hunter said that Hicks was always a five-tool talent; he just needed to learn how to study pitchers, master the mental side of the game. “If someone would put a test in front of you and you hadn’t studied, how much pressure is that?” Hunter would ask. Hicks, 27, didn’t fail in spring training, when Judge narrowly beat him out to be the starting right fielder. 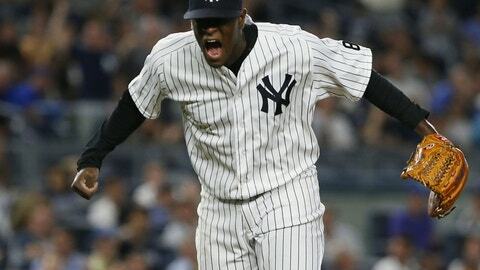 And he isn’t failing now that he is getting the opportunities that manager Joe Girardi assured him would come – opportunities that grew when Jacoby Ellsbury went on the disabled list May 25 with a concussion. Through 204 plate appearances, Hicks is batting .313 with a .424 on-base percentage and .578 slugging percentage – good for third in the American League in OPS (Judge is first). He already has established his career-high with 14 doubles, and his 10 home runs are one short of his previous best. 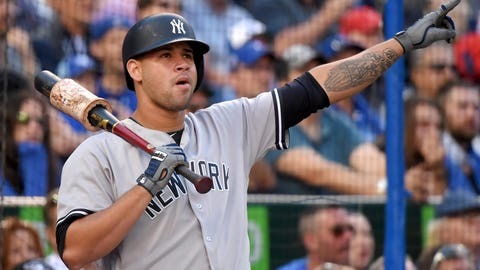 Funny how these things work out: Hicks might never have become a Yankee if not for the rise of catcher Gary Sanchez, whose emergence during the 2015 Arizona Fall League gave the team the comfort to trade catcher John Ryan Murphy. The Murphy-for-Hicks trade looks like an absolute theft for the Yankees, with Murphy batting only .218 with a .653 OPS at Triple A. Hicks, who mostly struggled in his first season with the Yankees, finally is showing why the Twins selected him with the 14th pick in the 2008 draft. Hunter was not the only positive influence on Hicks in Minnesota; Hall of Famer Rod Carew was another, and Hicks still keeps in touch with him as well. In fact, Hicks traveled from his home in Arizona to visit Carew at his home in Orange County, Calif., before Carew received a new heart and kidney last Dec. 16. Carew, who said that Hicks is one of the few current players who calls him regularly, will tell Hicks what he sees and suggest adjustments when appropriate. The other Aaron, sitting on 307 career hits, isn’t likely to reach 3,000. But he sure has salvaged his career. 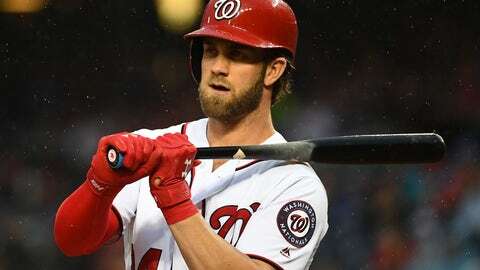 About three weeks ago, a rival evaluator predicted another second-half collapse for Bryce Harper, saying that the Nationals’ slugger had “zero balance” at the plate. I was skeptical of the evaluator’s remark — Harper, while fading somewhat, still had monster numbers at the time. But then his slide accelerated, prompting me to ask two other baseball people about him. Both concurred strongly with the initial evaluator’s assessment — that Harper was rushing to the ball, moving his head forward and pulling off with his shoulder, leaving himself vulnerable by opening up. 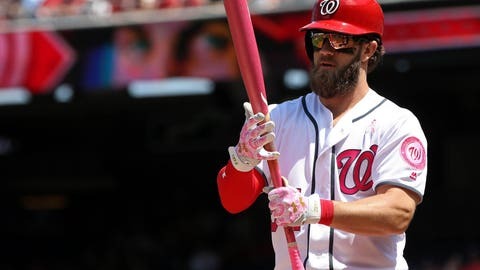 His numbers reflected his struggles — Harper through Sunday had batted .203 with a .637 OPS and just two homers over a span of 84 plate appearances. 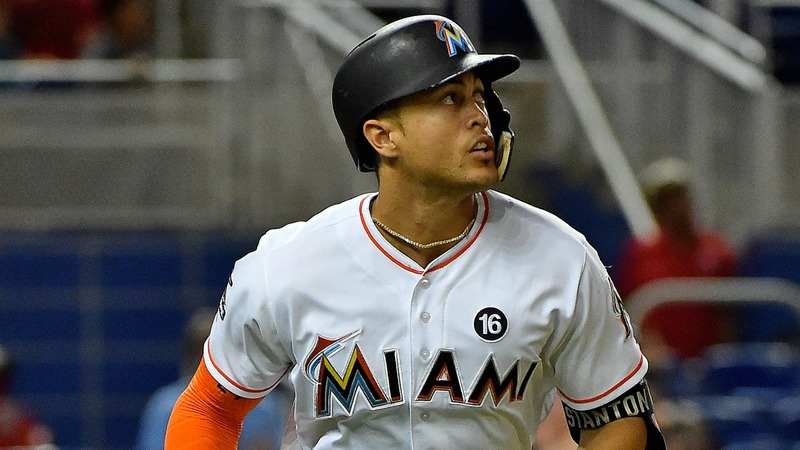 But on Monday night, he perhaps took a step forward, going 1-for-4 with two walks and his 16th homer against the Braves. The pitch Harper hit out was nothing special — a 92.6 mph fastball down the middle from Braves right-hander Mike Foltynewicz. So the criticism from the initial evaluator — that Harper is hitting only mistakes — might still apply. The question is how much Harper can change his unique style, if at all. Some with the Nats describe him as a “collider,” saying that he practically runs into the ball, like a car crashing into a wall. 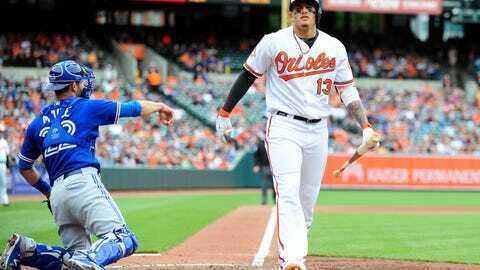 Both friends of Manny Machado and people with the Orioles believe that his season-long offensive struggles stem in part from the fact that he is dealing with unusual pressure for someone who is still just 24. Some of that pressure comes from Machado’s pending free agency after 2018, and perhaps a determination to outshine Harper, the other marquee member of that class. Part of it also might be that the All-Star Game is in Machado’s hometown of Miami, adding to his desire to produce a big first half. Alas, Machado is batting .218 with a .726 OPS, and the Twins’ Miguel Sano and Indians’ Jose Ramirez – two players enjoying better offensive production – rank ahead of him in the fan balloting. A third possible element is the emotional toll from Machado’s issues with the Red Sox in late April, though that one might be a stretch — Machado has crushed Red Sox pitching, with six homers and a 1.020 OPS in 13 games. The bottom line: Other things might be on Machado’s mind, and those things might help explain why his game is suffering. The Yankees feature two examples of young players who bulked up after strong rookie seasons, seemingly to their detriment. The first is right-hander Luis Severino, who had the only performance blip of his career last season after increasing his weight to 235 pounds. Moving to the bullpen helped — Severino needed fewer pitches to be effective. But he acknowledged that he wasn’t getting proper extension, so he worked this offseason on regaining the flexibility in his legs, stretching before and after workouts. Severino said he now weighs 222, and the difference in his performance is noticeable. His fastball command is back, his slider is better and he has regained confidence in his changeup, throwing it for strikes at will. Gary Sanchez, like Severino, had only good intentions when he packed on 12 pounds of muscle last winter. But rival scouts all season have noted that he is again struggling to block pitches. Yankees general manager Brian Cashman believes that the added weight affected Sanchez’s mobility behind the plate, but adds that Sanchez is working to address the problem and become more like the catcher he was last year. Sanchez holds a slightly different view — he said through an interpreter that he is indeed working on losing some weight, but didn’t think the added bulk created an issue with his catching. In any case, manager Joe Girardi says that Sanchez’s blocking has improved since the start of the season. THE ANGELS: HOW ARE THEY DOING IT? 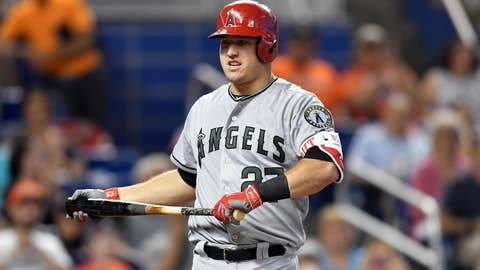 A team with a record around .500 rarely elicits anything more than a shrug, but the Angels qualified as one of the game’s biggest surprises even before losing center fielder Mike Trout to a torn ligament in his left thumb on May 28. Their performance borders on shocking. The sample is still small, but the Angels are 7-7 without Trout, averaging 5.07 runs per game. Prior to that, they were 26-27, averaging 4.02 runs per game. The offense, 13th in the American League in run production, still qualifies as abysmal. The rotation – without the injured Garrett Richards, Andrew Heaney, Tyler Skaggs and Nick Tropeano – is more of a pleasant surprise, ranking seventh with a 4.30 ERA. 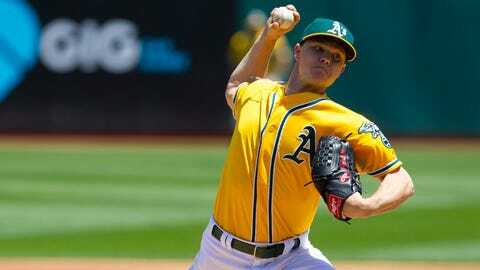 The strength of the club, though, is a bullpen that also has been ravaged by injuries, and continues to operate without the injured Huston Street, Cam Bedrosian and Andrew Bailey. No bullpen in the AL has allowed a lower percentage of inherited runners to score – a feat that is all the more impressive, considering the patchwork nature of the Angels’ relief corps. *David Hernandez: Trade acquisition from Braves, April 2017. *Yusmeiro Petit: Signed to minor-league contract, Feb. 2017. *Bud Norris: Signed to minor-league contract, Jan. 2017. *Blake Parker: Waiver claim from Brewers, Dec. 2016. *Brooks Pounders: Trade acquisition from Royals, Dec. 2016. *Jose Alvarez: Trade acquisition from Tigers, March 2014. *Keynan Middleton: Third-round pick, 2013. The Rockies are staging a campaign to get first baseman Mark Reynolds to his first All-Star Game, urging fans to write in his name on the ballot. Alas, Reynolds’ chances are quite slim, considering that he plays the same position as Ryan Zimmerman, Paul Goldschmidt, Joey Votto and Anthony Rizzo. 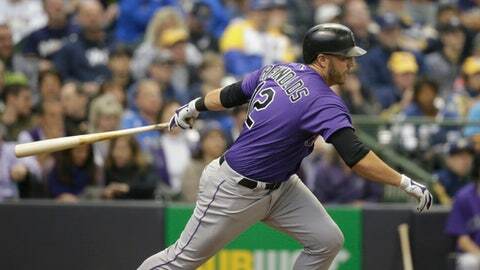 Still, Reynolds has 17 homers, a .390 on-base percentage and .968 OPS – not bad, considering that Ian Desmond is the Rockies’ entry at first base on the All-Star ballot, and Reynolds’ name is nowhere to be found. ASG rosters are reducing from 34 to 32 this season under the new collective-bargaining agreement, making it all the more difficult to create a spot for a player such as Reynolds. Would be cool, though: Reynolds, 33, is in his 11th season, and undoubtedly would be thrilled with the honor. If nothing else, perhaps baseball could find a spot for him in the Home Run Derby. Speaking of National League first basemen, remember when the Brewers’ Eric Thames seemed almost a lock to make the All-Star team? 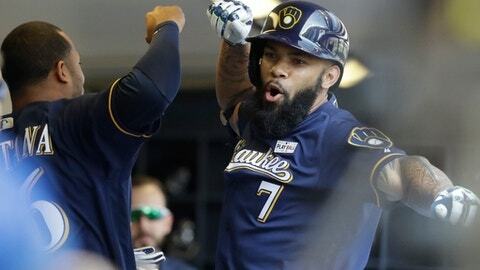 Some with the Brewers worry that Thames seems to wear every failure, and his .143 batting average and .662 OPS with runners in scoring position indeed might be a reflection of a hitter who is pressing in big situations. Thames in his first 62 plate appearances: .415 batting average, .500 on-base percentage, eight home runs, 1.481 OPS. Thames in 178 plate appearances since: .197 batting average, eight homers, .360 on-base percentage, .775 OPS. Teams might try to extract an even greater return than what the Yankees received for the top controllable reliever at last year’s deadline, left-hander Andrew Miller. As dominant as Miller is, a top starter, in theory, should bring back even more than outfielder Clint Frazier, left-hander Justus Sheffield and righties J.P. Feyereisen and Ben Heller. Then again, Miller was more of a sure thing at the time he was traded than any of the starters mentioned above. 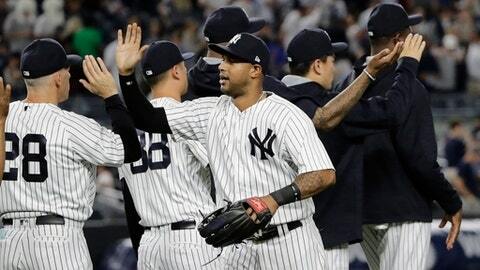 *The scoreboard at Yankee Stadium over the weekend was not the only indication that the Yankees and Orioles are two ships passing in the AL East night. A lesser but equally telling sign was the Yankees’ recent trade of infielder Ruben Tejada to the Orioles, a trade that stemmed from the Yankees’ abundance of shortstops throughout their minor-league system. The Orioles, lacking such talent, want to evaluate Tejada as a potential replacement for J.J. Hardy, who almost certainly is in his final season with the club. Hardy needs 600 plate appearances for his $14 million option to vest; it’s difficult to imagine the Orioles allowing him to reach that number or exercising the option themselves when Hardy’s .539 OPS is the second-lowest in the majors. *And finally, the Yankees’ choice of Judge with the 32nd pick of the 2013 draft not only looks like a major coup, but the sequence of events leading to the selection also reflects well on GM Brian Cashman. On Nov. 13, 2008, Cashman acquired Nick Swisher from the White Sox for infielder Wilson Betemit and pitchers Jeff Marquez and Jhonny Nunez. 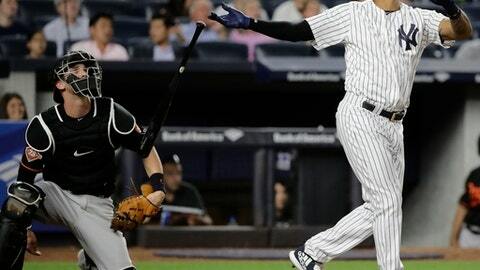 The trade was a rout for the Yankees, with Swisher averaging an .850 OPS in his four seasons with the club and helping the team win the 2009 World Series. Then Cashman did another smart thing, allowing Swisher to leave for the Indians on a four-year, $56 million free-agent contract entering his age 32 season. The Yankees got something out of that, too: The compensation pick that turned out to be Judge.